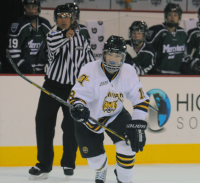 Quinnipiac’s Amanda Colin gets hit along the boards in Friday’s game vs. Mercyhurst. Quinnipiac’s Morgan Fritz-Ward picks up her glove from the ice in Friday’s game vs. Mercyhurst. Quinnipiac’s Nicole Brown tries to play the puck from her knees in Friday’s game vs. Mercyhurst. Quinnipiac’s Breann Frykas slides on the ice in Friday’s game vs. Mercyhurst. Quinnipiac’s Felica Viewig smiles after scoring a first-period goal in Friday’s game vs. Mercyhurst. 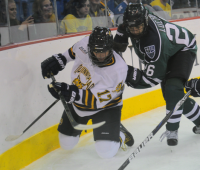 Quinnipiac’s Kelly Babstock vies for the puck in Friday’s game vs. Mercyhurst. Quinnipiac’s Nicole Brown plays the puck in front of the net in Friday’s game vs. Mercyhurst. 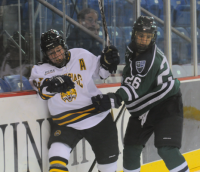 Quinnipiac’s Kristen Tamberg falls to the ice in Friday’s game vs. Mercyhurst. The Quinnipiac bench celebrates after Brittany Lyons scores a second-period goal in Friday’s game vs. Mercyhurst. Quinnipiac’s Kelly Babstock scores her first goal of the night in the second period of Friday’s game vs. Mercyhurst. Quinnipiac’s Kelly Babstock celebrates after scoring her first goal of the night in the second period of Friday’s game vs. Mercyhurst. 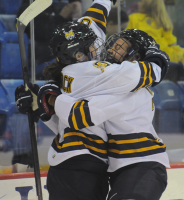 Quinnipiac’s Kelly Babstock celebrates with Nicole Kosta after scoring a goal in the second period of Friday’s game vs. Mercyhurst. Quinnipiac’s Brittany Lyons dives for the puck in Friday’s game vs. Mercyhurst. Quinnipiac’s Nicole Kosta dives for the puck in Friday’s game vs. Mercyhurst. 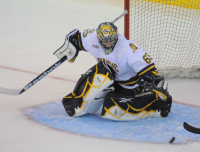 Quinnipiac’s Victoria Vigilanti makes a save in Friday’s game vs. Mercyhurst. Quinnipiac’s Kelly Babstock celebrates after scoring the game-tying goal with 40 seconds left in the third period of Friday’s game vs. Mercyhurst. 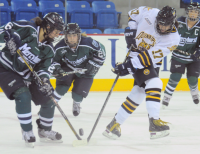 Quinnipiac’s Cyndey Roesler shoots the puck in Friday’s game vs. Mercyhurst.